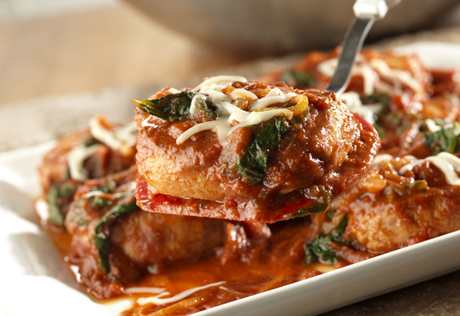 Juicy pork chops are sauteed to perfection and served with an appealing sauce made with marinara Italian sauce, frozen chopped spinach and onion, then topped with shredded mozzarella cheese. Heat 1 tablespoon of the oil in a 12-inch skillet over medium-high heat. Add the pork chops and cook until the chops are well browned on both sides. Remove the pork chops and set them aside. Reduce the heat to medium and add the remaining oil. Add the onion. Cook and stir until the onion is tender-crisp. Stir the sauce and spinach into the skillet and heat to a boil. Return the pork chops to the skillet and reduce the heat to low. Cover and cook until the chops are cooked through. Sprinkle with the cheese.